It's long been known that the water adjacent to the Kennedy Space Center, which houses an arm of SpaceX in Florida, are fully off limits to surfers and swimmers. But it hasn't stopped us wondering what delights are served up on that stretch of coastline when a premier, macking swell rifles in. Well, thankfully, a little NASA insider has snapped these images for your perusal, peeling back the curtain and revealing those forbidden waves. Not for the first time, but when such trinkets are dangled just out of arms' reach, it sends the imagination into overdrive. 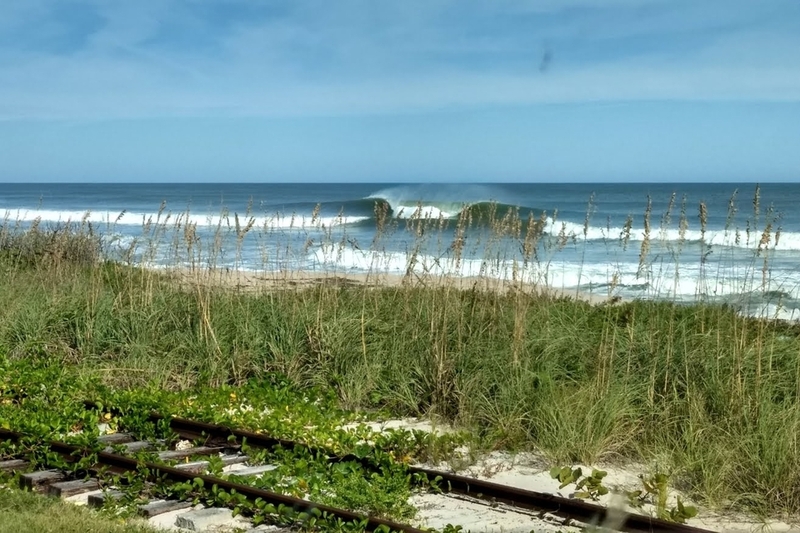 A run of swell that set Florida alight over the weekend gone and bringing you all you see throughout this feature. Want to know what the surf's doing a few days out? Head HERE. Apparently, if you're fishing, you're fine to dip your rod in the water here. But for surfers, it's on full lockdown, though military personnel can pass through with permits. It's a shame, because we can't imagine a more wonderful setting for watching the next flight in to the cosmos. And, oh, do the waves look good. This particular wave you see on the cover was togged just off from the tracks used to transport old Apollo parts to launch pads. Ain't that neat? And while we're certain SpaceX won't grace the humble pages of MSW, we're going to keep the identity of our tipster hush-hush. Anyway, we, naturally, had a few questions about the images, here's how it played out. Firstly, these images are great but tell us a bit about yourself, what do you do at NASA? Well, I was raised on the southern outer Banks of NC, so surfing came early for me. My childhood was surfing, skating, and fishing. In my 20's, I bounced around with US Coast Guard which brought me to Florida and the space coast. I started working for SpaceX roughly 16 months ago. Let's just say I work in the launch department. So, when and where were these photos taken? These photos were taken on November 24. A beautiful, medium period ENE swell coupled with light offshore wind. Buoy was reading 9.6ft@10 seconds with SW wind. And it’s closed for swimmers and surfers right, why is that? That's fair, I think, but agonising. Look at that thing! Are there people at SpaceX who surf? There is a handful of us, but not many. [laughs], doubtful. NASA and Cape Canaveral Air Force will secure a perimeter before a launch. Definitely don't want to be near it in case of a mishap. How often do you get waves like this? Only hurricane swells and nor' easter's. It doesn't get good often, but it's always fun to mind surf when it's on. And mind surf we will. Enjoy!